Samsung unveiled its new fitness trackers – Gear Fit 2 Pro and Gear Sport – two weeks ago at IFA 2017. The Gear Fit 2 Pro went on pre-order in the US in the same week. Now, the company is releasing the Gear Fit 2 Pro in its home market Korea. Samsung has also released the newest version of the Gear VR in the country as well. The Gear Fit 2 Pro, which is aimed at swimmers, is priced at KRW 220,000 (about $199) and is widely available across the country. The fitness tracker is a 5ATM certified device and is water resistant up to 50 meters, which makes it swim proof. It also features the Speedo On app that can measure swimming related metrics such as lap count, lap time, stroke type, and more. The sport tracker is more accurate in tracking not only workouts such as basketball, cycling, dancing, running, walking, but also sleep. 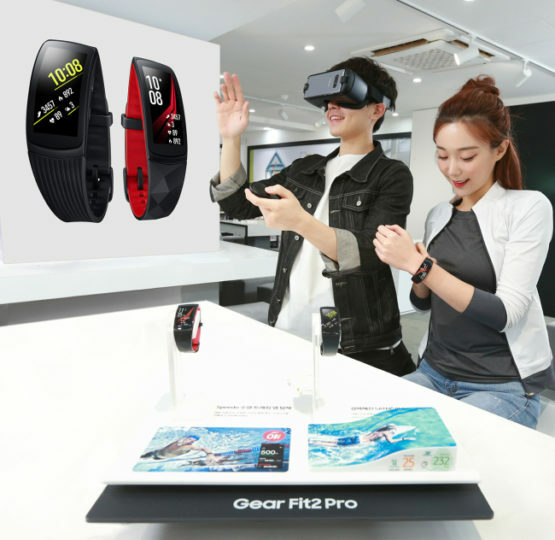 “Our new Samsung wearables help consumers ‘go beyond fitness’ and enjoy an active, balanced and fulfilled life in a smart and seamless,” said Koh Dong-jin, president of the IT & Mobile Communications Business at Samsung. Samsung is also bundling the U Flex wireless earphones with the Gear Fit 2 Pro for free. Samsung also announced that it will launch the Gear Sport in Korea in a few weeks. The newest version of the Gear VR, however, will be launched in the country on Wednesday. It works with the Galaxy S8, Galaxy S8+, and the newly launched Galaxy Note 8. When in Europe? and what about apps?